Hello, there, it's been a while! After getting ready to move at the end of May and then unpacking everything in our new apartment, I needed some time to fully settle in before I was ready to get back into the kitchen. The bright side is, though, I've had more than enough time to brainstorm new recipes and I can't wait to share them with you! This is something simple to help myself get back into the groove of blogging (sorry, not sorry, I have a life outside of this website, surprise, surprise!) but also to appreciate how a sauce or dressing can really transform a meal. I mean, do you eat pasta plain or nachos without cheese sauce? No, because you're a human being not a soul-less monster. I've shared my love for tahini in past recipes like my Blueberry Oatmeal Energy Bites, which are packed with healthy carbs for a solid start to the day. Tahini is a great alternative to peanut butter for when you need something thick to bind ingredients together but don't want the flavor to be too overbearing. I use tahini almost exclusively now over peanut butter. I also find it to be less processed and it's clearly more versatile, too. One of my favorite salad dressings, Lemon Tahini Yogurt Dressing, uses tahini as one of the main ingredients, for a creamy and thick texture. The most important ingredient, however, is not tahini - surprise! Recently, I discovered gochujang, a sweet and spicy, fermented red pepper paste, and I can't stop putting it into everything I make. I now prefer this over Sriracha, buffalo, or pretty much any other spicy sauce/dressing. A little goes a long way but this red pepper paste is steal easily build-able to reach the perfect level of deserved spiciness. I love this stir fry when I've come home from a long day and need something comforting but still have substantial nutritional value. You get plenty of protein from the tofu and broccoli, plus healthy fats from the sesame oil. The carbs in the noodles will keep you feeling full but not over the edge stuffed. I love making stir fries because they're so incredible customizable and one of the easiest ways to incorporate all the vegetables you possibly can into your diet! They're also a great leftovers type of meal - you throw all your leftovers from the week into a large pan, add noodles or rice and serve. 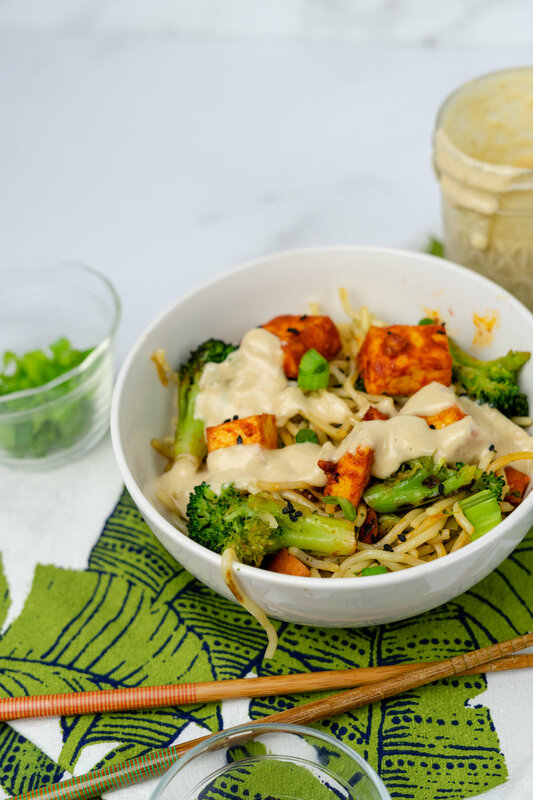 While the tofu sits, prepare your sesame tahini dressing. Combine all ingredients in a sealable mason jar and shake it until smooth and easy to drizzle. I recommend adding 3 tbsp to start and then build up to 4 or 6 if necessary. Also, push down the sides with a spoon and scrape the bottom in case any tahini gets stuck around the edges. Set aside once desired consistency is reached. At this time, the tofu will be ready to bake. Place the marinated tofu on a parchment or silicon lined baking sheet, drizzling the remaining marinade on any pieces that look less coated. Place in the oven and cook for 20 minutes. While the tofu cooks, cube your carrots and mince your green onions. In a large pan over medium heat, add the 1 tbsp of sesame oil. Add your green onions, stirring occasionally until fragrant. Add the carrots after about 1 minute. Add the 2 packages of Hokkien noodles, breaking them apart in the pan. *** Once the noodles have spread out in the pan, add the frozen broccoli, stir again, and cover with a lid so the vegetables can steam-cook. Occasionally stir to prevent burning, about every two minutes. After 20 minutes, remove the tofu from the oven and allow to cool while you assemble your bowls. Add a generous helping on the noodle and vegetable mixture into two large bowls followed by 5-6 cubes of spicy tofu. Drizzle about 1 - 1 1/2 tbsp of the sesame ginger dressing over both bowls. Serve and enjoy! *Don't worry if the marinade seems too spicy, you can always add extra noodles or sesame ginger dressing. **The longer it sits, the spicier it will become! ***They will not stay together the way udon would - Hokkien noodles break into smaller pieces usually.